Onychomycosis, a fungal infection of the nail plate, is a common dermatological condition frequently observed in clinical practice [1–4]. Estimates suggest approximately 5.5% of people are affected world-wide, with a greater incidence among elderly and immunocompromised individuals, as well as people with comorbidities, such as peripheral arterial disease and diabetes [2, 5–8]. Primarily caused by dermatophyte infection (specifically Trichophyton, Epidermophyton or Microsporum) or non-dermatophyte moulds or yeasts (e.G. candida) , onychomycosis often presents as nail dystrophy, discoloration and onycholysis, with or without strong odour [3–5]. The condition may be painful , cosmetically displeasing  and negatively affect self-esteem and quality of life [5, 7], as well as result in injury to adjacent skin and infections [5, 7]. Effective and safe treatment is therefore essential. Several traditional treatment options are available for onychomycosis, including topical antifungal regimens, systemic oral medications, as well as emerging therapies, such as laser, iontophoresis, UV light and photodynamic therapy [6–8, 10]. Whilst emerging therapies are gaining popularity, they are often expensive to set up and there is little evidence to support their use in onychomycosis [11, 12]. Traditional treatment choice often depends on the type and severity of the infection, as well as patient comorbidities [3, 6]. There is a general consensus that topical treatments may be effective in mild to moderate cases, where less than 50% of the nail plate is affected and in the absence of nail matrix involvement [3, 10]. Oral medications are often reserved for more severe cases  and may be associated with an increased risk of hepatotoxicity and at times, contraindicated in individuals with affected kidney or cardiac function . Despite the availability of different treatment options, complete cure of onychomycosis is challenging to achieve [1, 5–8, 11, 13]. Two Cochrane reviews have examined the evidence for oral  and topical  treatment intervention for onychomycosis. Unlike the body of evidence examining the efficacy of oral medication , few (mostly small) studies have investigated the efficacy of topical treatments for onychomycosis . Despite this disparity, early and effective treatment with a topical antifungal agent is often preferred, particularly for those most at risk of onychomycosis, who are often unable to tolerate the side-effects of oral medication. Topical treatments, however, often require prolonged treatment regimens [at least twelve months) and have low success rates . Efforts that improve the efficacy of topical antifungal treatments are therefore of interest. Chemical nail avulsion with topical urea cream has been suggested to improve the efficacy of topical antifungal treatments by improving penetration and bioavailability of topical agents [4, 6, 7, 10]. Urea, in concentrations over approximately 30%, is considered a keratolytic agent  that softens and hydrates the nail plate by denaturing the nail keratin and thus enhancing the drug penetration and promoting the avulsion of affected nails [3, 4, 7]. Urea has long been used in dermatology and podiatry  for the treatment of onychomycosis [16–21]. Despite the theoretical basis to support the use of urea in the treatment of onychomycosis, the efficacy of urea as a monotherapy and an adjunct treatment remains unclear. The NHMRC FORM methodology  was used in the interpretation of findings and the implications for clinical practice. Previous systematic reviews have used this framework successfully [25–27]. The framework consists of five main components: 1) evidence base (level on evidence hierarchy); 2) consistency; 3) clinical impact; 4) generalizability; and 5) applicability to the Australian health care setting. 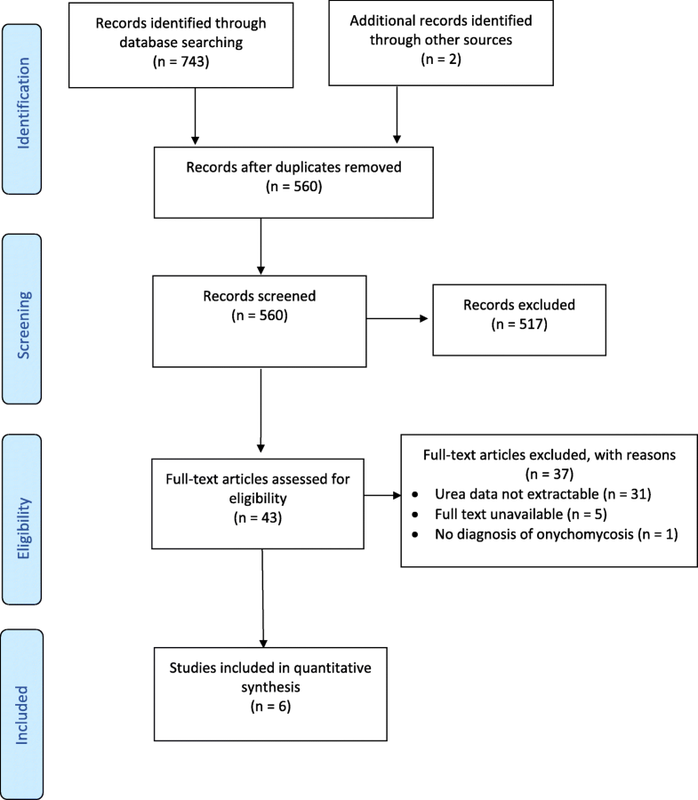 This last component was not used for this systematic review due to its international focus. Data extracted from included studies were examined descriptively. Table 2 presents the methodological quality of studies, as rated by a modified McMaster Critical Review Form for Quantitative Studies . As presented, only two studies [30, 31] provided Level II (randomised controlled trial (RCT)) evidence. The main methodological concerns were: lack of justification of the sample size (only one study did the power calculation , lack of psychometrically robust outcome measures (OMs) (validity and reliability recorded only in one study ), failure to avoid contamination and co-intervention and lack in reporting statistical and clinical significance of the results (four studies reported statistical significance [31–34] and none reported clinical significance). Furthermore, the randomisation methods were not appropriate where groups were randomised [30, 33]. Comparators were other topical antifungals (1% fluconazole, 1% bifonazole and 5% amorolfine), [30–32], and oral anti-fungal agents (150 mg fluconazole and 250 mg terbinafine), [34, 35], (Table 3). A range of outcome measures were utilised to evaluate the efficacy and safety of treatment interventions for onychomycosis. 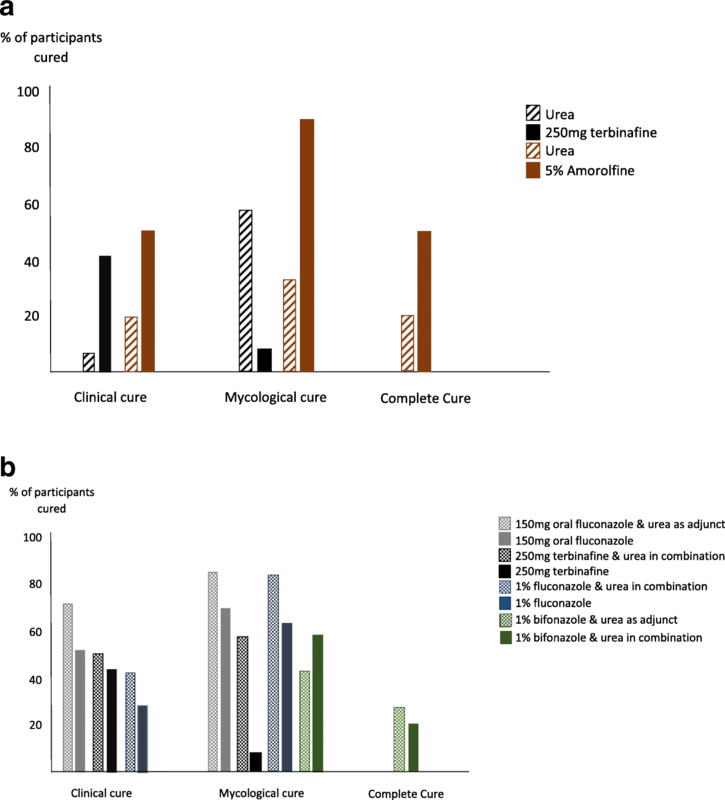 Treatment efficacy was considered in terms of mycological, clinical and complete improvement or cure, while safety was considered in terms of patient- or clinician-report. Overall, three studies [30–32] examined clinical improvement (improvement observed visual inspection), four studies [31–34] reported clinical cure (> 90% clinical improvement) and five studies [30–34] reported mycological cure. Two studies [31, 32] assessed complete cure (defined as clinical and mycological cure). Adverse events were reported in four studies [30, 31, 34, 35]. Table 3 provides a summary of the outcome measures examined across studies. Two [30, 31] of the three [30–32] studies used urea as an intervention and reported greater clinical improvement when compared to control groups. One of the studies used urea as a control and reported less clinical improvement (48%) when compared to the intervention (amorolfine) group (85.7%)  (Table 4). Five studies identified mycological cure using microscopy and fungal cultures [30–34]. This was the most common outcome measured with the consistency in the outcome measures used. However, all studies failed to comment on the validity and reliability of the microscopy and fungal cultures. The mycological cure achieved varied from 8.3 to 82.8% when using either urea on its own, urea nail removal before starting topical antifungal cream or urea in combination with a topical antifungal (Table 4, Fig. 2a & b).